Marijuana is included in the Drug Enforcement Administration’s Schedule I group of drugs. As such, it is legally categorized as being one of the most dangerous drugs, with the highest potential for addiction and with no accepted medical use. Not even cocaine is included in Schedule I. Is marijuana really so dangerous that it deserves to be listed as a Schedule I controlled substance? That question is the subject of an intense debate across the United States, one which has proceeded to the ballot box in many states. Opponents of the DEA’s view that marijuana is among the most dangerous drugs available are gaining steam in their fight to have the drug legalized. The fact that Washington and Colorado passed laws to legalize marijuana last year made major headlines in the news, but in truth they were only the two states that have traveled the furthest down a path that many others are also moving along. Several other states, including California, Nevada, Oregon, Nebraska, Minnesota, Mississippi, Ohio, North Carolina, New York, Maine, Vermont, Connecticut, Massachusetts and Rhode Island, have decriminalized marijuana. Certainly, many patients who use marijuana for medicinal purposes do report feeling relief from their symptoms, but this does not mean that the drug is safe. In fact, only 1-2 out of every 500 doctors say that they will recommend that a patient should use medical marijuana, according to a representative from the online database MarijuanaDoctors.com. Most of the others simply do not consider that the benefits outweigh the risks. One of the major risks associated with medical marijuana — one which advocates will not likely mention when trying to sell you on the idea — is the fact that today’s pot is not the same as what they were smoking in the 1960s. The War on Drugs has made it necessary for growers, dealers and users to get more bang for their buck by breeding the plants for the purpose of making them more potent, so that a person can get high with a smaller amount of the drug. Consequently, cannabis is now as much as 20 times more potent than it previously was. The medicinal benefits of marijuana are associated with compounds known as cannabinoids, of which there are around 80 present in marijuana. The most well-known of these is tetrahydrocannabinol, more frequently referred to as THC, the chemical responsible for getting pot smokers high. 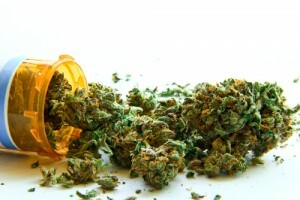 Cultivation of marijuana over the years has steadily increased the amount of THC all out of proportion to the other cannabinoids, so that the drug is now far more powerful in terms of getting a user high, while many of the other cannabinoids that contribute to the medicinal properties of the drug are less prominent. Consequently, marijuana is increasingly addictive. People who smoke marijuana can become physically addicted as well as forming an emotional dependence as they gradually become more and more prone to use the drug as a way to find relief from stress. Medical marijuana can be addictive just as much as pot smoked for purely recreational purposes. Another major issue to consider on the topic of medical marijuana is the fact that using it can still get you in trouble with the law. For one thing, marijuana is not recognized for medicinal use under federal law, so you could still be arrested and convicted for a drug crime if you were caught by federal law enforcement. The same is true if you transported the drug across state lines into a state where medical marijuana has not been legalized. Even in states where it is legal, a user can still be arrested under several different circumstances. You might get caught possessing more than the allowed amount. You could be discovered to be growing more plants than are permitted. You could even be arrested for driving under the influence and see your driver’s license suspended. These are only a few of the risks associated with medical marijuana. Supporters of legalization tend to argue that there is nothing wrong with cannabis and that the current legal situation is unjust, but there is far more to the picture.